Reduce the size of those bloated profiles. Clean out temp files from all profiles, and the system temp folder. Tired of getting prompted for cloud options in Office 2013? Network Administrator can make your skies clear again. What USB Devices are installed on your Network? This plugin will let you take a look. Want to make sure the latest security patches are installed? Network Administrator can silently download and install the latest critical, and security patches. See what user logged on to a machine last. Network Administrator can show you the account name, and the date and time. Need to notify your users that the server is going down in five minutes? Don’t mess with ‘net send’ any longer. Network Administrator can send that message to users in a flash. Get a complete list of users that ever logged on to a machine. Includes the user type (Standard or Administrator), and the date and time that they logged in. Have a set of shortcuts you want to copy to everyone’s desktop? Or a configuration file you need to place on their C Drive? Use the folder copy plugin to copy files and folders to many machines in just a few clicks. Have remote registry access to a remote machine, but remote desktop is disabled? Remote desktop enabler can turn on remote desktop so you can get into that machine asap. Want to change the port Remote Desktop uses to listen for connections? Use this plugin to change the port that Remote Desktop listens on. Got an MSI file you want to install silently on 100 machines? 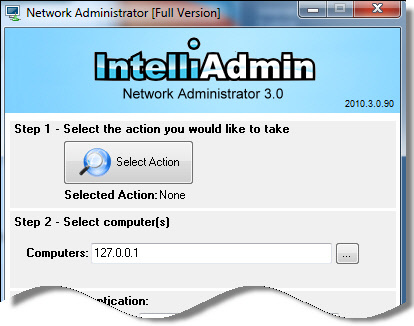 Network Administrator can do it in a few clicks. Build batch files, or VBS files and easily execute them remotely. Have a corporate logo you want to have on everyone’s background? Use the wallpaper plugin to set it across your network. It will even take care of copying it to the remote host for you. Resetting the domain administrator password is easy, but what happens when an employee leaves the company and you have 50 machines with the same local administrator password? Normally, you would walk around to each one and change it. With the ‘Set Local Administrator Password’ feature you can change it across your network without even getting out of your chair. Use Tight VNC, or Real VNC on your network? Need to change the password on a 100 or 1000 machines? 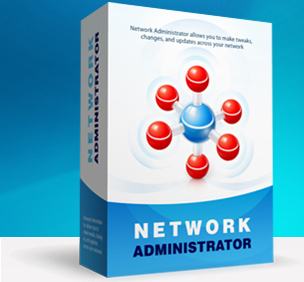 Network Administrator can change them all in one sweep of your network. Quickly shutdown, or reboot computers. You can even set a time limit before your action takes place, and tell users why they need a reboot or shutdown. Prevent access to USB flash drives, while allowing USB based keyboards, mice, and scanners. Set windows to automatically logon as a specific username and password. Upgrade to Office 2007 or 2010, but want users to save in 2003/XP format by default? Use the default document set feature to make this change in a flash. Users keep messing with the control panel, and making life hard for you? Use the control panel plugin to disable access. Get rid of that pesky warning you get when trying to execute downloaded files. In Windows 7, windows will maximize automatically when you drag them to the edge of the monitor. Disable this ‘feature’ with ease. Have you noticed that in Windows 7 or 2008 you can’t see mapped drives in an elevated command prompt? This fixes that by enabling mapped drive sharing between standard and elevated apps. Prevent users from burning DVD and CD Roms – No longer will you need to worry about data leaving your network. Got a printer that corrupts printer jobs once in a while? Stop wasting time deleting them by hand. Use this plugin to quickly clear out the jobs and get printing again. The list of plugins is growing all the time, and when you purchase you will automatically get new plugins delivered to you as soon as they are released. Purchase includes 1 year of free plugin and application updates. Got an idea for a plugin? Send it to us at plugins@intelliadmin.com and we will add it to the wish list.